The site survey and material characterisation informed a greater understanding of stump deterioration mechanisms and should guide future research endeavours at Florissant such as environmental monitoring, simulation modelling, and the evaluation of other potential conservation treatments. 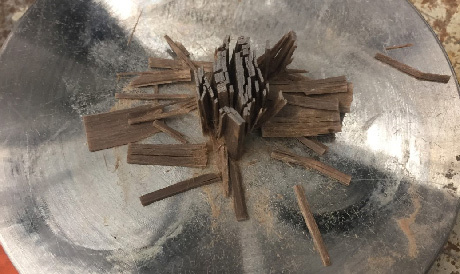 An evaluation of the mechanical properties of Florissant wood was critical for understanding the mechanical behaviors of a variety of treatments. Testing was conducted at the University of Pennsylvania’s Laboratory for the Research of the Structure of Matter (LRSM). Samples for testing were prepared both for mechanical strength testing and thermal coefficient of expansion, to be described in the following section, by a combination of continuous-rim diamond bladed brick/stone/CMU table-saw, segmented diamond bladed tile saw, low-speed diamond wheel saw, and petrographic grinding, and polishing wheels. 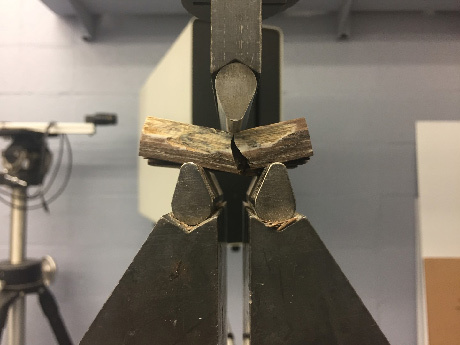 A preliminary compression test was executed to gauge in what ways its mechanical properties might be anisotropic, this was followed by a three point bending test in order to understand the modulus of rupture in one specific grain direction of interest, tangential, for through-face or blind pinning. To date, a conservation treatment of mechanical pinning was considered as one measure, among many, in a holistic conservation program. More treatment tests will follow. 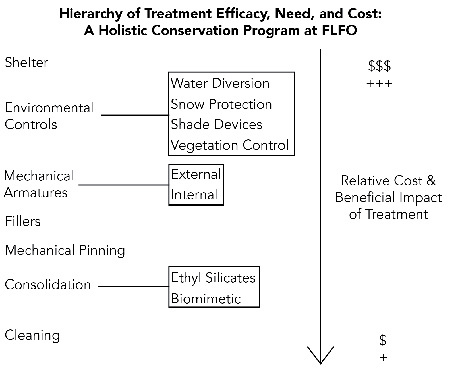 A program was prioritised in terms of predicted treatment beneficial impact and expense. The most pressing solution is the elimination of environmental stress. FLFO stumps are the primary reason for tourist visitation and thus enable monument survival. Stump mothballing being impractical, and contrary to site values of display, the best option is an enclosed or semi-enclosed shelter followed by well-designed environmental controls. Nevertheless, existing cumulative damaga needs to be stabilized. Assemblies were considered unsuccessful if they did not resist human pull out strengths. Holes were drilled into an Indiana limestone proxy with a cordless Makita Hammer Drill (XPH07) and then cleaned with a bottle brush and compressed air. Pins were threaded into sleeves using a cordless Makita Driver Drill (XDT14). Pliers were used by hand to extract failed assemblies. Those unable to be extracted went on to a mechanical pull-out stage at the Laboratory for Research on the Structure of Matter (LRSM) at UPenn. Observations and photographs recorded modifying assembly variables such as diameter:dimension:durometer. Initial pull out failures suggested that cancellous screws and woodscrews are too aggressively threaded, compromising tube integrity. Nylon threaded rods at small diameters fail torsionally due to a combination of drill torque and frictional tube resistance around 1” embedment. General masonry tungsten-carbide tipped drill bits were the most efficient. During drilling of dark coloured sections black effluent was discharged from the samples and were sometimes accompanied by an oily slick, and swamp-like smell. Drilling duration was approximately 20 minutes per sample because the drill bit was removed every 10 seconds and the hole flushed with water to cool the sample and drill bit. Sample compression during drilling effectively avoided large conical failure mode typically associated with through-stone drill puncturing. 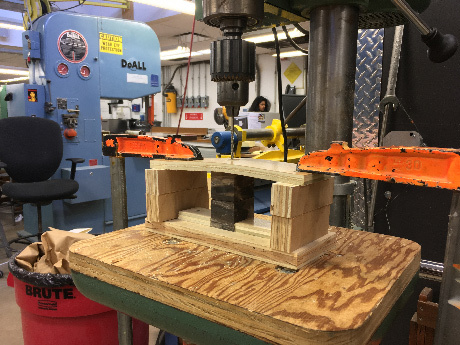 It was decided to test cohort 10 because the pin failed at 2/3’s the flexural strength of FLFO wood. C9 was eliminated as a choice because it was too close to FLFO modulus of rupture, leaving little margin for error.